Out of the millions of chess players worldwide, there are less than 1,500 grandmasters, and in America there are fewer than 100. The requirement list to achieve this title is strict: a rating of at least 2500 and earning three grandmaster norms, which means an amazingly high 2600 performance in at least three international tournaments sanctioned so by the International Chess Federation (FIDE). Kayden Troff, standing, plays chess in Forest Park. Becoming an Eagle Scout is another incredible achievement. It is calculated that only 4 percent of Boy Scouts are ever granted their maximum rank, and the requirements necessary for this take many years to fulfill. To be both is truly one of a kind. Yesterday, one of the participants of the 2016 U.S. 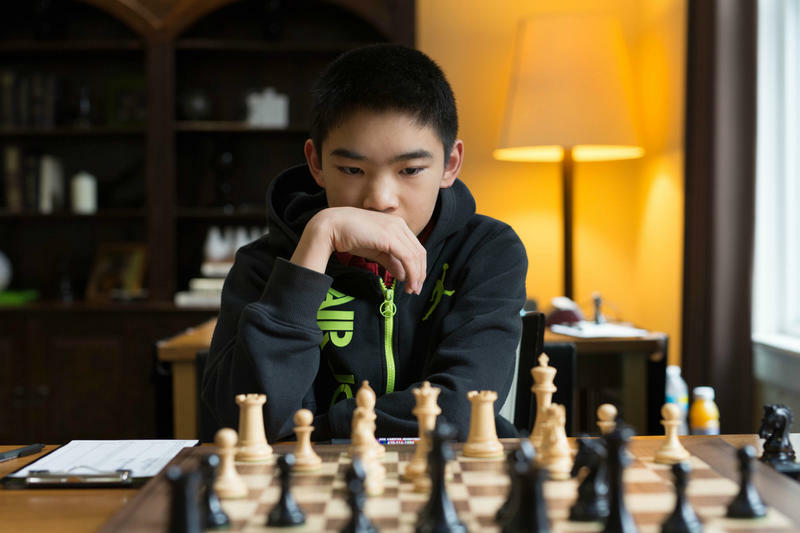 Junior Closed Championship, an incredibly strong tournament itself with the top 10 under-20 players in the entire country, became the first chess grandmaster to reach the rank of Eagle Scout. Kayden Troff, from Utah, was honored with a small, intimate ceremony at the Chess Plaza at Forest Park. 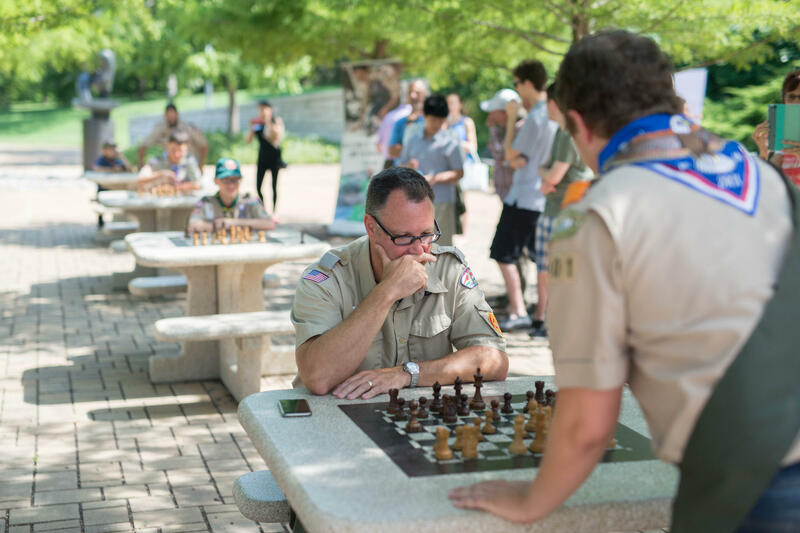 The correlation between scout service and chess is an easy one to make. Through the Chess Club and Scholastic Center of Saint Louis, spearheaded by Jeanne and Rex Sinquefield, chess has already helped thousands of kids in the St. Louis area improve their skills in pattern recognition, memorization, calculation, planning, strategy and many others. 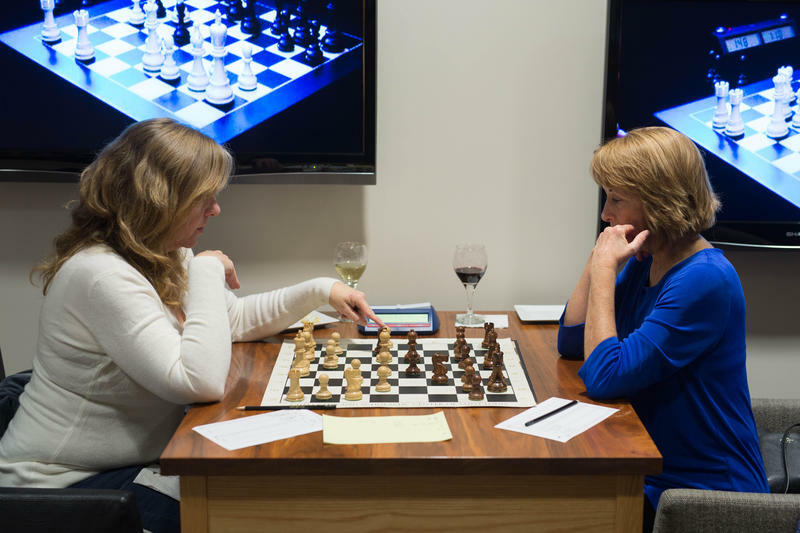 Numerous studies have proven that chess is a great tool for education. 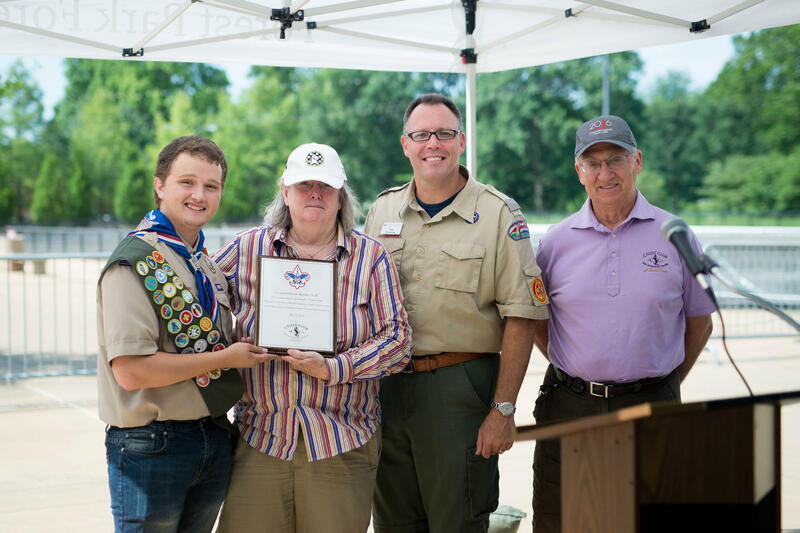 Kayden's Eagle Scout Service Project was running a chess camp for children with disabilities in Utah. Participants ranged from kindergarten to high school with a majority being in elementary school. When asked to talk yesterday in Forest Park, it was clear that Kayden is a humble and smart young man — qualities that are exemplary for both a chess player and an Eagle Scout. The chess merit badge has quickly become one of the most popular badges in the Boy Scouts of America merit badge catalogue. “Since the Boy Scouts of America started the chess merit badge,” Jeanne Sinquefield said, “we have had over 100,000 boy scouts in America earn chess merit badge.” Out of the 130+ badges available, the chess merit badge is undoubtedly one of fastest-growing badges available. It, of course, was not missing from Kayden's sash. Kayden is one of the two grandmasters at the U.S. Junior Closed Championship, and despite a rocky start, he is still in a fighting position in the tournament. Jeffery Xiong from Texas and Awonder Liang from Wisconsin are currently in the lead. Make sure to follow the action live online at uschesschamps.com. Alejandro Ramirez is a grandmaster who has led lessons and lectures at the Chess Club and Scholastic Center of Saint Louis, which provided the On Chess articles. For the seventh consecutive year, the Chess Club and Scholastic Center of Saint Louis will host the U.S. Junior Closed Championship. The most prestigious junior event in the country will take place July 8 through July 17. This past Tuesday morning, Walnut Grove Elementary School of Ferguson, hosted the official launch of a new after-school chess instruction pilot program. More than 30 students were on hand along with Principal Jennifer Andrade to welcome their special guests as well as to challenge the grandmasters in attendance to a competitive but friendly game of chess. Photographers, reporters and camera persons were also on hand to record this special event.